Did That ‘Digital’ Lead Come From Print? When Toronto-based company WebsiteBox recently asked 340 real estate professionals if print is dead, the answer was a definite "no." Print is very much alive, and agents float out listing and business information on millions of printed pieces each year — magazine ads, flyers, postcards, business cards, and more. But a problem lies in the fact that agents often have no idea of how many leads come from print as versus digital, writes WebsiteBox CEO Peyman Aleagha in an article for Inman News. "When customers receive that postcard and decide to visit your website to learn more about you or your services, they are officially print leads, not online leads. Surveys and studies have shown conclusively that more than 80 percent of people are going to real estate websites to learn more about the company or agent after they find out about them through other marketing." 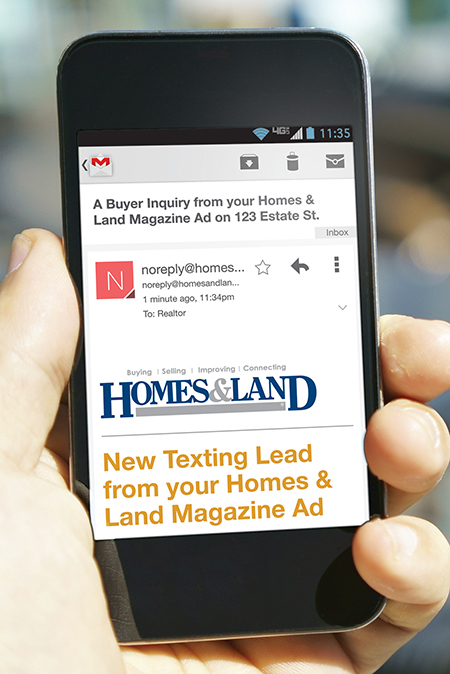 Homes & Land has a simple solution for producing trackable leads from print — text codes. Every time a potential homebuyer types the text code printed on your advertised listing into a phone and presses send, you have instant proof that your printed ad is getting attention and producing leads.